The PlayBase might be late to the soundbase party, but it's what the party has been waiting for. Sonos doesn't launch a new product every month, or even every year, but when it does it's well worth the wait for top notch sound. The company's latest speaker, the PlayBase - which is designed to slide underneath your TV rather than mount onto the wall - joins the PlayBar soundbar in Sonos' home theatre line-up. The PlayBase is some four years in the making, which is both one of its attributes - in terms of its meticulous design - but also one of its biggest flaws, as it's late to the soundbase party. Sonos has some fabulous speakers in its portfolio, especially the newer ones, but the new PlayBase is one of the sleekest. The company said the aim was to allow the PlayBase to "disappear into the home" and the new device certainly achieves this when sat beneath a TV. There are no unnecessary details and the slim build allows it to go relatively unnoticed when between a TV stand and the TV itself. If you have a wall-mounted telly then a mounted PlayBar is probably a more suitable solution. The top of the PlayBase is smooth to touch, and super flat, while rounded corners give an overall softer finish to an angular TV set sat on top. There are no apparent joins anywhere for a seamless look, with clean lines that make the speaker seem as though it has been created from a single sheet of material. All the internals are wrapped within a glass-filled polycarbonate exterior to ensure vibrations are kept to a minimum - and despite being essentially plastic, it doesn't look cheap at all. In tune with 2015's Play:5, the PlayBase has capacitive touch controls at the top so you can tap and swipe without having visually unappealing buttons to stare at. The Sonos tag is positioned at the front of the Base, to the centre of the acoustically transparent grille. This grille is made up of over 43,000 holes (apparently, we didn't count) and features a staggered pattern in order to hide the internals of the PlayBase better from line of sight. The hole sizes are five different sizes, from the front to the sides, in order to allow better ventilation for the built-in woofer. At the left of the PlayBase is the pairing button (for Wi-Fi, not Bluetooth), while the rear has the connection ports in an inset moulded section, hiding the power cables as much as possible. There is an Ethernet port, optical audio input and a power supply at the rear, with the PlayBase requiring a broadband connection, power and a TV with optical audio output in order to work. Yes, like the PlayBar there is no HDMI - which some might not be overly thrilled about. The PlayBase is available in black and white colour options, like the Play:5, Play:1 and the Sub, but our favourite is definitely the white as the PlayBase's design details are more striking. The PlayBase connects to the Sonos platform wirelessly, like the rest of the Sonos line up. This means you'll be able to control it via the Sonos app, or select partner apps, like Spotify, and you'll have access to over 80 music services. It also means that you'll also be able to control PlayBase using your voice later in 2017 when Amazon Alexa compatibility appears, although Sonos has yet to detail an exact date for this feature. As the PlayBase is a TV speaker as well as another Sonos multi-room speaker, you can also control volume via a TV remote and the PlayBase can send TV sound to other Sonos speakers in your setup. For example, group your Play:5 in the kitchen to the PlayBase in your living room and you'll be able to hear the football or Strictly Come Dancing while cooking. Or maybe you use your TV to source digital radio. The PlayBase also includes the same features as the PlayBar, such as Dialogue Enhancement (which enhances vocal clarity) and Night Mode (which tones down the bass during loud action scenes). Both features are simple to activate, with a simple tap of each respective logo positioned above the PlayBase's volume control in the Sonos app. There are TV Dialog Settings within the Sonos app too, allowing you to adjust the Audio Delay if you find lip-sync isn't quite on the mark. This can also be done on your TV or set-top box, which might be the better option depending on whether the audio is behind the footage or vice versa. Like other Sonos speakers, it's also possible to adjust equaliser (EQ) settings on the PlayBase within the Room Settings of the Sonos app, allowing you to reduce or increase the bass and/or treble. The PlayBase is compatible with Trueplay tuning too, which is a software feature that adjusts the sound of the speaker to the specifics of the room. In the case of both the PlayBase and the PlayBar, tuning is done in two stages and requires your input and an iOS device (no Android just yet). What is Sonos Trueplay and how does it work? It takes a few minutes but it is well worth doing - we noticed a significant difference in our home before and after completing the tuning process, both in terms of balance and overall sound quality. It shows how much sound can be tuned via software. The Sonos PlayBase features ten class-D digital amplifiers, along with a ten-driver speaker system comprising six mid-range drivers, three tweeters and one woofer, all of which have been custom designed for the PlayBase. Sonos claims the result is a sound stage that is much wider than the speaker itself, which our experience has confirmed. We've used the PlayBase on its own, as well as in a 5:1 setup with a Sonos Sub and two Play:1s - and both setups are impressive. The sound quality from the PlayBase is fantastic, as those who own other Sonos speakers will have come to expect. Naturally, there is more significant bass when the Sub is involved but the PlayBase is more than capable on its own, filling the room with sound and delivering an all-in-one solution as both a music speaker and TV sound enhancer. It delivers plenty of bass on its own, foregoing the need for the Sub - which is great seeing as that requires a further £700 investment and some more space. The PlayBase delivers a clear range, natural and crisp dialogue and clear distinction between frequencies, pleasing us in both music speaker terms and as a home theatre speaker. As with the rest of Sonos speakers, the PlayBase supports up to CD quality (16-bit), meaning no Hi-Res Audio (24-bit), which the likes of Sony and LG offer within their multi-room systems. We have never really found this to be an issue as Sonos speakers all offer excellent sound quality, but there are some who will find this disappointing from the music speaker angle of the PlayBase. The Sonos app platform remains the best out there in the multi-room segment, and the company's wireless mesh network technology is excellent for a solid connection. We've had no drop-outs or connection issues in our experience. The app interface is smooth, with access all compatible streaming apps through the Sonos app, as well as search by artist, track, album, playlist, stations, hosts and podcasts. It's a lot easier than going into each service app individually, though there is now limited control through Spotify too, which may be useful if that's your go-to preference. The search icon is positioned in the top right of the app, a drop down menu with the 'rooms featuring Sonos speakers' sits in the middle and the option menu is defined with three lines in the top left of the app. You'll be able to group the PlayBase to any other Sonos speakers you have by tapping on the room name and ticking the other rooms you want to hear your TV in, as we mentioned above, while all settings including EQ adjustments are found within the three lines in the top right. Overall, there are plenty of useful features within the Sonos app, including the ability to set alarms on your speakers, or adding a Sub or surround speakers to your PlayBase, all of which are easy to implement with step-by-step guidance. You can read our Sonos tips and tricks feature for all the options on what you can do with a Sonos system. The Sonos PlayBase is beautifully designed as the perfect sound-enhancing solution for your telly. It delivers excellent sound quality and enough bass to be sufficient as a top notch standalone speaker too. And if you want to add other Sonos speakers and the Sub then it can also be setup as the ultimate 5.1 system. The downside is that it's super expensive, especially with the recent Sonos price hike, and many who own a smaller TV will probably see it as a pricey addition. The decision to use optical audio only and not offer HDMI is certainly questionable, too, as is the lack of DTS support, making the PlayBase a music system with the advantage of TV sound enhancement rather than an advanced home cinema theatre system. What Sonos is great at is promoting its family of products. As part of the Sonos system the PlayBase can link into the Sonos multi-room system via a mesh network connection, which is as robust as they come and, in our experience, never suffers connection issues. The Sonos app is unrivalled in its ease of use and versatility too. If you've got the cash then the PlayBase is a have-your-cake-and-eat-it kind of speaker. It's great for music, radically enhances TV audio, blows away the PlayBar's more dated design, and is the perfect addition to Sonos's full around-the-home audio package. For those who have a wall-mounted TV, the Sonos PlayBar is likely to be the better option. It offers all the same features as the PlayBase, including compatibility with the rest of the Sonos system, but you can mount it to the wall under your TV. As it is a little older, it doesn't have the new design featured on the new Play:5 and the PlayBase, but it still delivers great sound. 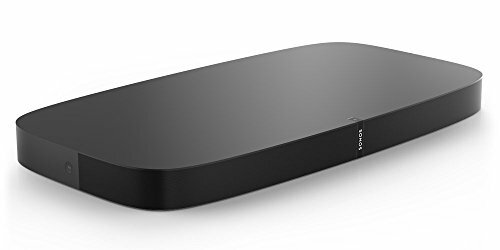 The Heos Bar is a direct rival to the Sonos PlayBar, offering a range of 4L-enabled, HDR-compatible HDMI 2.0a ports, allowing you to feed sources such as Blu-ray players directly into the back. As the PlayBar is with Sonos speakers, the Heos Bar is compatible with other Heos multi-room audio products and will stream audio through internet services as well as via Bluetooth and your own music library. There is also a separate Heos Subwoofer available which can be paired with the Bar and two Heos speaker for 5.1 audio.